The only drawback of the paper clips mentioned in the previous tip is their width. They don't work well at tight curves like the waist of the body. 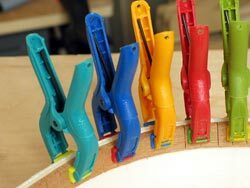 The best lining clamps currently available are small plastic mini spring clamps like those shown in the picture. They have narrow and swiveling jaws and are stronger than clothspins which are still used at the Martin Guitars factory. They also add a touch of color to boring workshops.